Made for the versatile Nordic climate and with sustainability at the top of the agenda, furniture from Fabrikant is produced in the woods of Småland in a fair and environmentally conscious way, with inspiration from the surrounding nature. Fabrikant has made sustainable furniture since 2015, when Sofie and Johan Örnvinsson launched the brand, but the full story goes back further than that. “The journey started more than 30 years ago, when the family company began to make dish-baskets in stainless steel for larger dishwashers used at schools, hospitals and restaurants,” Fabrikant’s creative designer Sofie Örnvinsson recalls. The durability and sustainability of the stainless steel inspired the duo to bring their knowledge and experience into the field of furniture made specifically for the harsh Nordic climate. They introduced the collection BARR around two years ago, with its lounge chairs made of stainless steel wire, inspired by pine needles. “The construction of pine needles is really amazing. They are strong but yet bendable,” Örnvinsson explains. The BARRcollection of sturdy and functional furniture continues to grow and includes creations such as smaller lounge chairs, coffee tables, side tables and stools, all of them with a functional design. 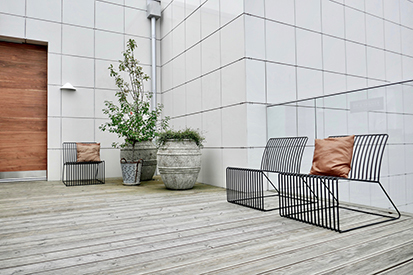 “The lounge chairs allow you to link them together to a sofa, and several of the stools can become a long bench,” Örnvinsson adds.